We've reached part 'U' of our alphabetical pub crawl. As Uxbridge and Upminster are a bit far out to attract pub crawlers, we instead decided upon a theme: Unusual pubs. We asked you to nominate pubs with odd names, peculiar furnishings, or unusual histories. You didn't disappoint, supplying dozens of ideas. 6. The Lamb: unusual in its preserved Victorian interior. Noted for the 'snob screens' and a miniature beer garden. =7. Prospect of Whitby: much-loved Wapping pub with a long history and its own noose. 9. Princess Louise: another Holborn mainstay, noted for its restored Victorian interior and listed Gents toilet. =10. Jerusalem Tavern: the Clerkenwell legend and a rare outlet for St Peter's brewery. =10. Mayor of Scaredy Cat Town: perhaps the most unusual on the list, given (a) its weird name and (b) that you enter through a fridge. Green dotted pins are our top 10 places, red pins are other nominations. Note: we only mapped nominations for which there is an obvious 'unusualness'. Suggest additions in the comments, and we'll be happy to add them. This event has now taken place, but feel free to follow in our footsteps. In a departure from our normal practice, we're not going to visit the top few in the list. Two reasons. (1) We've been to several on previous pub crawls. 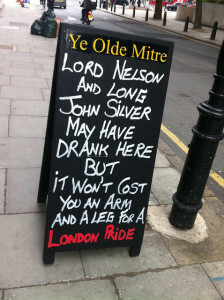 (2) Part 'Y' of the pub crawl is likely to be 'Ye Olde pubs', so we'll save some of the Holborn gems for then. Instead, we've put together an editorial selection of oddball places, taking two proper pubs and two unusual bars. Note that the schedule is subject to change — we're contacting the last two venues to check they can handle a crowd. 6pm The Windsor Castle (cos we absolutely have to see this place, even though it's miles from any others). The group size for this pub crawl will be smaller than usual (10-15 places), as the third venue is tiny. The pub crawl will take place on Monday 6 January - so that the smaller bars are fairly quiet. If you'd like to come along, email matt@londonist.com quickly. 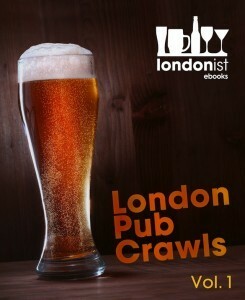 Get the Londonist Book of London Pub Crawls for less than the price of a pint. Ten original pub crawls, not published on the web.